Brussels sprouts are the best example of vegetables that we unfairly vilify because we had traumatic experiences of boiled, greyish globes filling our plates as kids. But if you’re willing to prepare this wild cabbage cultivar with a little bit more care, you can enjoy a bright green, nutty vegetable through the fall and winter. It pairs admirably with full-flavored meats — try it with venison dishes! While 85% or so of the European production comes from the Netherlands, the U.K. and Belgium, Brussels sprouts are cultivated in smaller quantities in Hungary, Poland and Central Russia. Eastern European recipes often involve sour cream, onion and bacon. 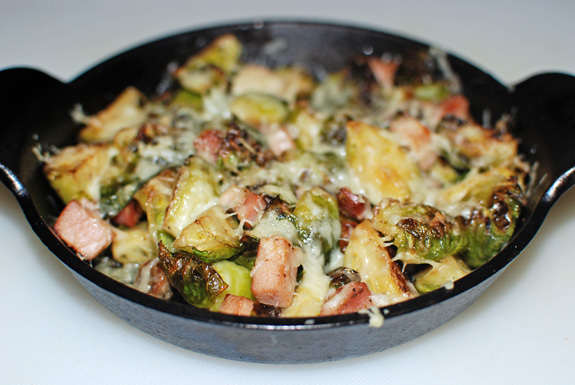 I present a similar, simple preparation, with a focus on the proper cooking of the sprouts. In a hot pan, sauté the Brussels sprouts in olive oil over high heat until brown on all sides. Season with salt and pepper, cover with a lid, and cook over medium heat until soft, stirring occasionally. Remove the lid, add the porchetta, and cook over high heat again until slightly crispy. Transfer to two 6″ cast-iron pans, sprinkle with gruyère, and cook under the broiler until the cheese has melted, for a couple minutes. Serve immediately.